A new report published by Scottish Green MSPs shows that the Scottish Government’s plan to cut aviation tax will cost the Scottish public purse hundreds of millions of pounds and put £47.3million into the pockets of businesses. It also shows wealthy frequent fliers stand to gain hugely more from the tax cut than regular travellers. This week the Scottish Greens will make a final attempt to amend the Air Departure Tax Bill at Holyrood so that instead of rewarding wealthy households and corporations and a highly-polluting industry, any new tax regime encourages a reduction in aviation and a shift towards cleaner forms of transport. The report finds that much of the benefit of the planned cut will accrue to those living in Scotland’s central belt; only 6% of all international flights by UK residents are taken by children, so the SNP’s claim that this policy will help “families” is highly misleading; such a generous tax subsidy for business flights within the UK will harm rail travel by incentivising a shift towards air travel; and reducing the cost of air travel will lower the cost of taking holidays outside of Scotland relative to holidays within Scotland, “cannibalising” holidaymakers from Scotland’s domestic tourism industry and worsening the deficit between what we spend abroad and what visitors spend here. A new report published by Scottish Green MSPs shows that the Scottish Government’s plan to cut aviation tax will cost the Scottish public purse hundreds of millions of pounds and put £47.3million into the pockets of businesses. It also shows wealthy frequent fliers stand to gain over 40 times as much from the tax cut as regular travellers. This week the Scottish Greens will make a final attempt to amend the Air Departure Tax Bill at Holyrood so that instead of rewarding wealthy households and corporations and a highly-polluting industry, any new tax regime encourages a reduction in aviation and a shift towards cleaner forms of transport. Last month at Holyrood’s Finance Committee, Green amendments to the Bill were blocked by SNP and Tory MSPs. – Over half of Scots do not fly and will therefore be ‘losers’ under the planned policy change. – 70% of those in the wealthiest income decile, earning over £45,210, stand to benefit directly from a cut in air passenger taxes. – The benefits of the planned cut will accrue predominantly to those living in Scotland’s central belt. – Only 6% of all international flights by UK residents are taken by children, so the SNP’s claim that this policy will help “families” is highly misleading. – Businesses will gain 29% of the benefit, worth £47.3 million in the first year. – Such a generous tax subsidy for business flights within the UK will harm rail travel by incentivising a shift towards air travel. – Reducing the cost of air travel will lower the cost of taking holidays outside of Scotland relative to holidays within Scotland, “cannibalising” holidaymakers from Scotland’s domestic tourism industry and worsening the deficit between what we spend abroad and what visitors spend here. – “Hypermobile” travellers make up less than 5% of all passengers at Scotland’s airports, yet each of them will gain the equivalent of £635 a year if the air duty cut goes ahead. – The SNP’s commitment has fired the starting gun for a race to the bottom, and any competitive advantage for Scotland’s airports will be short lived. “Given the social and environmental challenges we face, a cut in aviation tax was always a bizarre priority from the Scottish Government. Most Scots will lose out if this cut goes ahead, and it’s grossly misleading of ministers to try to sell this as about families when the overwhelming winners from this policy are wealthy frequent fliers and their businesses. “Our analysis shows clearly that cutting and then scrapping taxes on air travel will primarily reward corporations and Scotland’s richest households for choices that will set us back in the fight against climate change, at the same time as damaging domestic tourism and the rail sector. The single biggest outcome of this change, if it is made, will be more wealthy Scots flying to London to spend their money there. “It seems difficult to understand how a proposal that is so wildly at odds with the rest of the Scottish National Party’s policy agenda ever made it into their manifesto. But those of us who follow the aviation lobby closely recognise that the SNP has allowed itself to become an unwitting pawn in the long game being played the special interests that will profit most directly from this regressive policy. Winning in Scotland is merely the first stage in the aviation industry’s wider plan to achieve tax-free status throughout the UK. 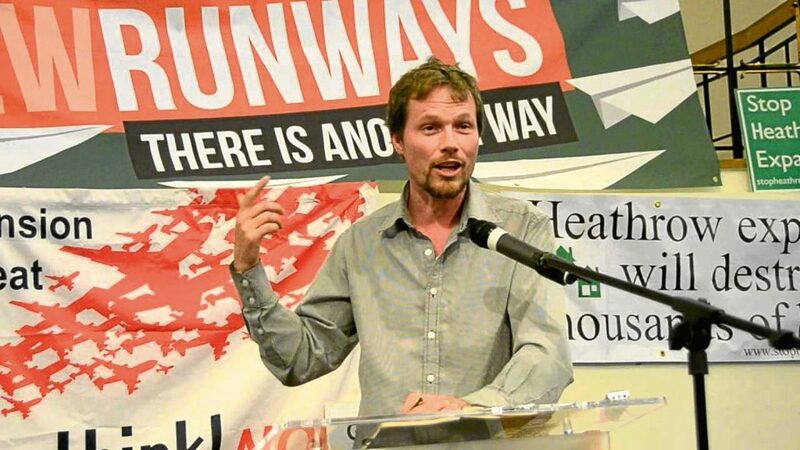 The report, “Air departure tax: who benefits?”, has been written by Leo Murray, founder of the Free Ride campaign and Director of Strategy at climate change charity 10:10, and by Charlie Young, an independent researcher with a background in economics and climate change. The report uses figures from Transport Scotland, HMRC and the CAA. You can download a copy here. Leo Murray claims better off travellers will benefit most. Plans by the Scottish Government to reduce and then abolish Air Passenger Duty (APD) in Scotland are “predominantly a tax giveaway for Scotland’s wealthiest households and corporations”, according to a new report. 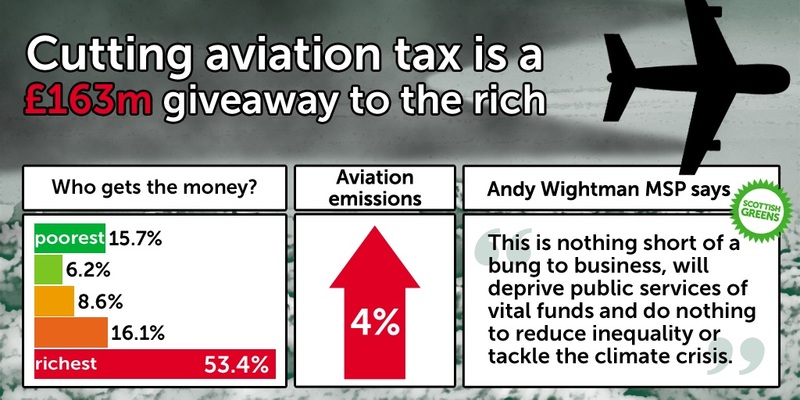 The study by the Fellow Travellers campaign group against high carbon emitting air travel found 70% of Scotland’s richest households stand to benefit from the proposed cut, compared to 30% of the poorest. A Scottish air departure tax is set to come into force from April 2018 if passed by parliament, replacing APD. The SNP wants the tax cut by half by the end of this parliamentary term, with the charge to be scrapped when resources allow, claiming it will improve connectivity and create economic benefits. However, the Fellow Travellers report found that, based on official figures, halving the tax would lead to £189 million in lost revenue for Scotland by 2021/22. It says: “The SNP’s commitment has fired the starting gun for a race to the bottom on air passenger taxes in Great Britain. Any competitive advantage conferred on Scotland’s airports from a reduction in these taxes will be short-lived.” …. “This is predominantly a tax giveaway for Scotland’s wealthiest households and corporations.” APD currently brings in about £300 million per year. That could pay to employ 11,500 nurses. Or fund a year of childcare for 54,000 children. Or convert every bus in Edinburgh to being fully electric. Posted: Tuesday, June 20th, 2017. Filed in Climate Change News, General News, Recent News.